Follow the links to the various sections of the Hunts Point Slave Burial Ground (HPSBG) Curriculum. For guidance on developing lessons and other activities, utilize the lesson plan format and attached guide. You can also utilize the HPSBG curriculum as a template to start your own project to engage your local community. National Geographic Education recommends the Project's curriculum resources, declaring, "The Hunts Point Slave Burial Ground Project has a fantastic, standards-aligned curriculum. This citizen science project is a perfect example of the Geography of Civil Rights—this year’s  Geography Awareness Week theme." 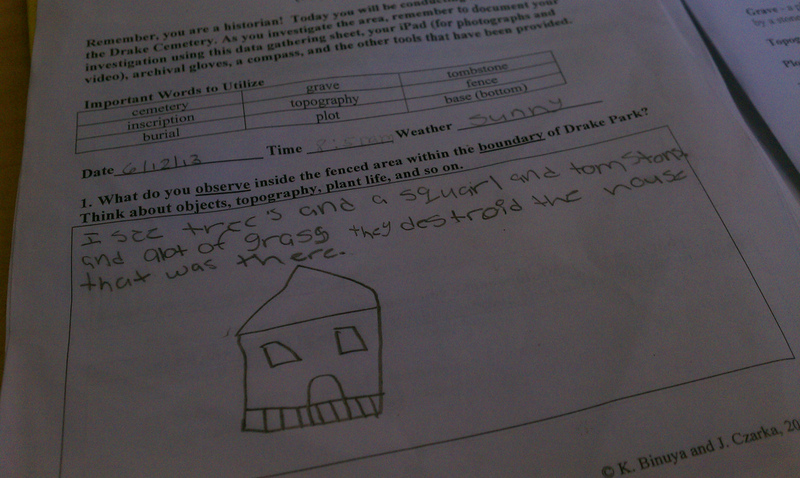 PS 48 student's field investigation sheet after exploring Drake Cemetery. Here we will locate curriculum ideas, lesson plans, units, field trips, tours, and other research opportunities to engage our students in the Hunts Point Slave Burial Ground Project through a collaborative process. ​Check out available hard copy resources in the PS 48 Hunts Point Slave Burial Ground Learning Center. The goal of these Common Core-aligned teaching materials will be providing a framework that allows students to lead the two part quest: a) to definitively determine the location of the burial site through historical texts, maps, photographs, census records, and even and oral accounts; b) and therefore to bring recognition to the lives and deaths, contributions, and role of these slaves in the development of New York through erection of a memorial of some type chosen by student input/research. *Please note: Educators should conduct lessons as pertains to the curricular needs associated with their teaching assignment. One does not need to teach lessons from each major project themes of the curriculum, though all project themes are Common Core aligned.